Last year, I shared my One Big Thing philosophy. The idea is simple: Focusing on one big thing each day is more productive and more satisfying than checking off as many tasks as possible. It’s also a daily practice. As I wrote: “Every morning I’d review my inbox, project trackers, and calendar, then write down my big things for the day.” Two and a half years from my original One Big Thing tweet, I’m still using this technique to plan my days. But my post was also a bit of an anti-to-do-list rant. Indeed, after years of intense fascination with finding the best kind of task-management system, I gave up. Today, I don’t use a to-do list. Instead, I use a “might-do” list. The Might-Do List is a bit like the Someday/Maybe List from Getting Things Done or the product backlog from agile engineering. It’s exactly what it sounds like: a list of things I might do someday. Tasks sit on my Might-Do List until I decide to prioritize them by making time on my calendar. In fact, I use multiple lists for keeping track of stuff. In addition to my general Might-Do List, I have a list of ideas for articles to write, ideas for sailing stories, and a spreadsheet with all of my boat projects. But I don’t recommend using a list as the plan for your day. There’s another great tool for that: the calendar. Most of us already use a calendar to keep track of meetings and appointments, so it’s the perfect place to schedule in time to work on things from our Might-Do List. Where does One Big Thing fit in? It’s a planning tool that sits between the Might-Do List and the calendar. It helps you narrow a near-infinite set of possibilities down to a very finite reality. The One Big Thing constraint forces you to think carefully about how you want to spend your limited time each day. The process of stepping from Might-Do List to One Big Thing to calendar works because it separates the decision of what to do from the act of doing it. I suffer from path-of-least-resistance thinking when I don’t plan. 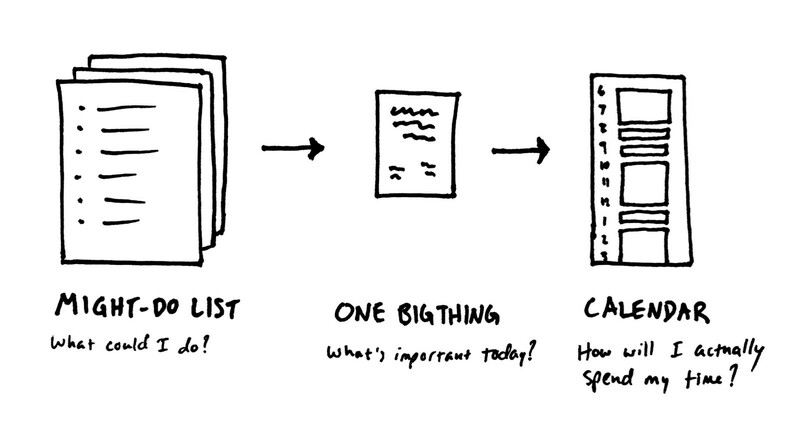 But when I use my Might-Do List and One Big Thing to put important projects on the calendar, I can trust myself. I know I made a thoughtful decision about how to spend my time, and I can pour my energy into the task at hand.